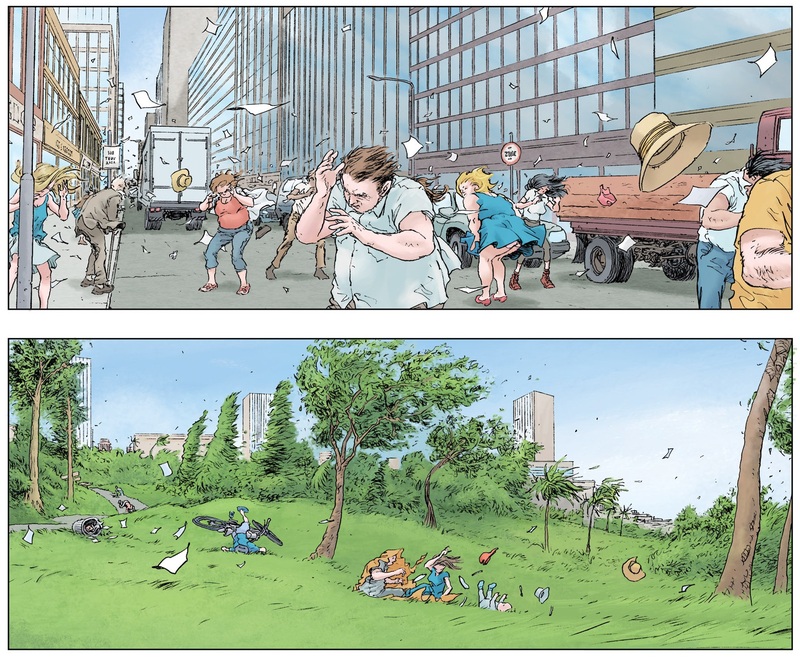 You may have noticed from my recent review of Pax Americana that I find Frank Quitely one of the most innovative comic artists out there. In fact he is actually my favourite artist above all others and no matter the book, I am always in awe of what I have just read. 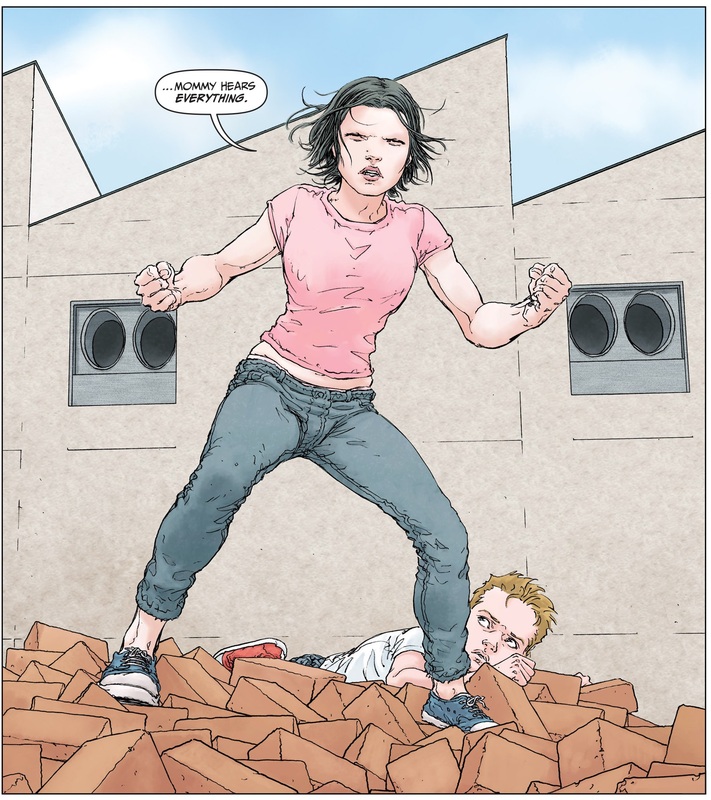 Even though it feels like Jupiter’s Legacy ended a long time ago, its return in issue five made me realise why I was so annoyed at not seeing it on the shelves for so long. It was so mind blowingly impressive and Quitely once again shines with some astounding action scenes. This issue really develops the motion and power of the superhero and uses a different set of tactics compared to Pax Americana. Hence the reason why I felt the need to tell the world about Frank Quietly, yet again. One of the cardinal features Quietly’s art is his use of detail because sometimes his faces look too expressive with every skin crease mapped out and then sometimes it appears so streamlined. Over the years he has learnt how to make best this effect and we see it in play in all his work. Watching Jason fly is a joy to behold because as he zooms across the water we can see the consequences of the movement around him. Note that his face is relatively succinct but his t-shirt is rippling in the wind. It You can just see the flickers of his baggy tee as he moves completely streamlined through the air with a rigid and straight posture. This is accompanied by a shot to him flying towards a bridge with the water almost parting with the force of his flight. 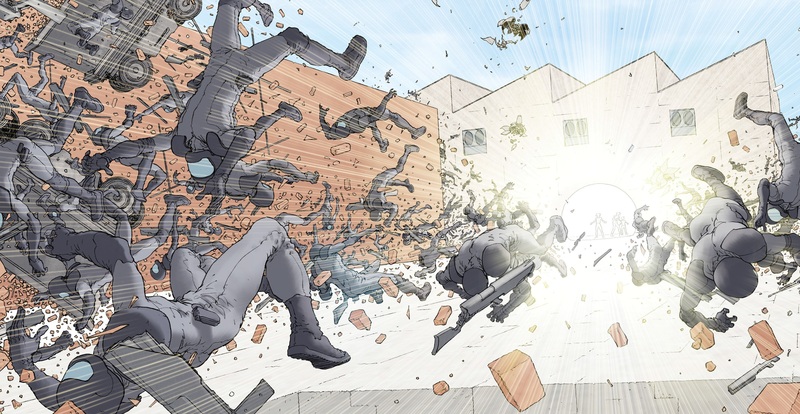 I am always amazed at how Quitely is able to portray the scene as well as he does, whether it is telling a story, creating a fight or delivering emotion, he always has a few tricks up his sleeve. The next aspect of his art demonstrated in this particular issue is that of perspective. If you return to the beginning of the comic you can see a powered individual being captured by Major Wolfe but it is her ability that is shown so impressively. Joan Wilson tries to escape a top floor office by charging out of a window, note the immense detailing of the breaking glass. But she lands as a giant and this is shown by her huge frame compared to the tiny people and cars around her. As she trips and falls you can almost feel the impact because of the huge dust clouds and the crumpled cars about her torso. The helplessness of Joan is really pronounced as she has been incarcerated but is clearly the largest person around as shown by her lying next to a regular building. There is a very astute sense of size and magnitude. The final battle is another achievement in power demonstration and relativity. The camera footage being reported on the news has an interesting wide angle of the confrontation. It shows how small the superpowered family are but also how strong they are as we see the fight from above. As we move closer there are some lovely panels as Chloe really lets loose. The scene where she unveils her true strength provides a breaking picture of devastation. The armed men just flail backwards in a completely uncontrolled way and the spread out at perfect angles. The accompanying vehicles, guns and bricks once again, show the raw energy that has been released. The streams of light that come from the central character actually depict the energy and its dissipation. The effects are obvious and the page just seems to move towards you. He follows up this image with Chloe attacking the Major with one of his vehicles and she smashes it across him, as she stretches with all her might. I quite like the idea of her movement and how much energy and anger is clearly involved in her strike. It is quite clear that Wolfe is going nowhere and the family will make their escape. After reading this comic, I immediately went back to read it again and take my time appreciating the art and how incredible the giant lady looks and how ridiculously strong the family is. I know there have been massive delays in the release of this book but Quitely is so amazing that one look and all is forgiven. His array of comic art expressions is beyond compare and Quitely has all the skills at hand, together with the most important part of his work; his imagination. Next PostThe Theatre List 14/1 – A long time ago in a galaxy…. 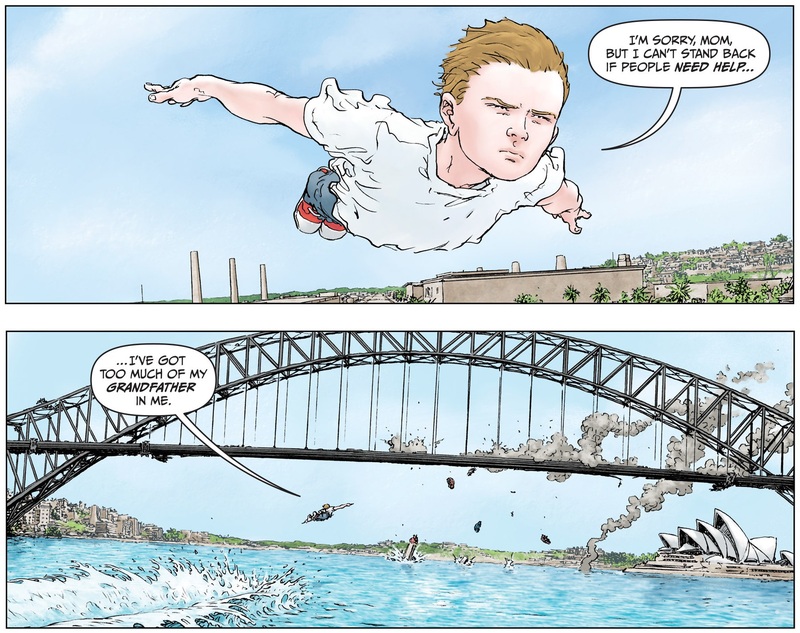 Great review on the last issue of Jupiter’s Legacy.